Why Should Dr. Kay Perform My Facelift? The continued effects of gravity, a decline in collagen production and loss of skin elasticity all combine to contribute to sagging, loose skin through the lower face, jawline and upper neck as aging progresses. A facelift in Washington DC tightens the underlying supportive musculature and removes excess skin to restore a smoother, younger look again. 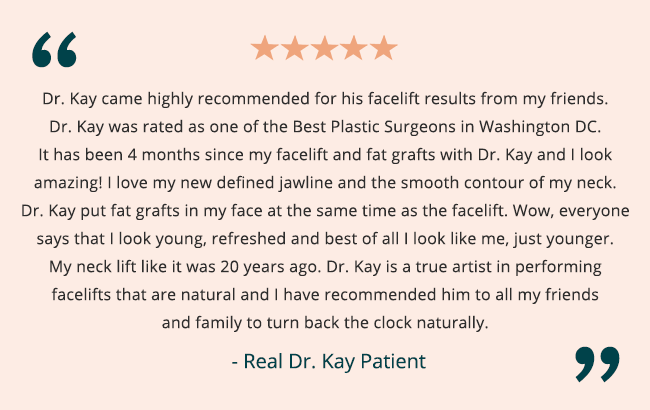 Recognized as one of the best plastic surgeons in the Bethesda-Chevy Chase metro area, Dr. Stephen Kay has helped thousands of women and men from Washington D.C. and beyond improve their appearance with a facelift. In addition to facial plastic surgery, Dr. Kay offers a full range of cosmetic surgery procedures. Please contact us online or call our Chevy Chase plastic surgery practice at 301-951-5120 for more information on facelifts. Dr. Kay’s primary area of expertise is facial rejuvenation, especially since he trained with the world famous French plastic surgeon, Paul Tessier in Paris. Dr. Kay’s patients have the advantage of having him combine volumetric restoration to his facelifts to achieve the most natural results. Kay Plastic Surgery offers a unique quick recovery plan that includes skin care (before and after surgery), vitamin alternatives and personalized nursing care. Our in and out of town patients at the Marriott Hotel also get a post-operative visit from Dr. Kay the morning after surgery. The best candidates for a facelift are women and men who notice sagging through the lower face, jowls and upper neck. It’s also important to be in good health overall, both mentally and physically, and to have realistic expectations about your results after surgery. While a facelift won’t help you look like a teenager again, you should enjoy a revitalized, refreshed reflection of yourself following your procedure. Please visit our before and after photo gallery to see real patient results that are possible after a facelift. The costs associated with a facelift will vary depending on the type of surgical approach Dr. Kay takes and whether additional procedures are performed at the same time. Total costs will include Dr. Kay’s surgical fee as well as the fees associated with anesthesia and the surgical facility and any follow-up appointments. Dr. Kay and his staff are happy to explain all the available options for cosmetic surgery financing that can help make your facelift even more affordable. As the body ages, collagen production declines and the skin loses both firmness and elasticity. This weakening in supportive framework within the skin means gravity can more easily take over, pulling skin, muscle and soft tissue slowly downward. A facelift helps turn back the hands of time by restoring more youthful contours to the face, along with correcting sagging or droopiness through the lower face and upper neck. During your consultation, Dr. Kay will discuss your goals for facial plastic surgery with you, along with going over all the details of your surgery and recovery so you’re fully informed about what to expect. In some cases, Dr. Kay may recommend combining a facelift with additional procedures for the best results, such as a neck lift to correct a prominent “turkey neck.” Alternatively, he may suggest a mini facelift as a less complex alternative to traditional facelift surgery if he feels you would make a good candidate. The techniques used during surgery itself will vary depending on the approach that Dr. Kay thinks will work best for you. During your consultation, he’ll explain where you can expect your incisions to be placed—most typically, hidden discreetly behind the ears and oriented toward the hairline. Through these incisions, Dr. Kay can tighten the underlying facial muscles while removing excess tissue and then improving contours. The results of facial plastic surgery are long-lasting and you should enjoy your new look for many years to come. Some patients may opt to schedule ongoing treatments from our medical spa to help extend the results of their facelift even longer. You can learn more about a facelift procedure here or learn more about Dr. Kay on RealSelf. 1 Why Should Dr. Kay Perform My Facelift? 1.1 Is a Face Lift Right for You?